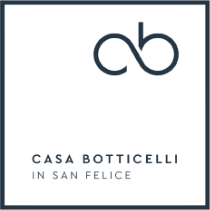 Welcome to Casa Botticelli, a new concept of art hotel in Florence. Book now your fascinating experience in an “art gallery" completely integrated with the furniture, composed of works of art, antiques, and local handicraft products. In each room are displayed several small masterpieces, reproducing an evocating setting, the same in which the Botticelli family, antiquarians for over 50 years, has always lived. You could visit their art atelier and shop in Via Maggio, a short walk by the boutique hotel. The art hotel becomes here a common space with an impressive atmosphere to be experienced by the guests, a radically different dimension of life, a real travel in time and across styles, a relaxing immersion in the “best” an “beautiful”. Many of the items you will see are for sale: we like the idea that our guests can bring home a piece of our familiar tradition so that they could remember every day their priceless holiday in Tuscany and Italy. Your stay in Oltrarno will be surprising, we will show you the best places to taste a glass of wine or an aperitif, the ovens able to delight with the Tuscan traditional bread, typical restaurants, clothes boutiques and much more: wherever you’re going to, the Santo Spirito neighborhood is made of culture and experiences. You will live a simple and elegant journey, sleeping in precious rooms, pampered by a hearty breakfast, by the cozy attentions of Eleonora, the owner (this was and is her home! ), and by an impeccable cleanliness that enhances the accurate, personalized, unique furnishings. A honeymoon with the artistic world, in an enchanting location (nearby Palazzo Pitti and the modern art museum), ideal for getting around on foot in downtown, enjoying a suggestive panorama. Discover the artists who are animating now the walls and rooms of our original gallery hotel art in Florence and reserve a sensual adventure now.